FORMER St Kilda and Carlton ruckman/forward Rod Galt, who topped the Blues’ goalkicking table in season 1978, has died on the Gold Coast at the age of 67. Greg Galt confirmed that his older brother passed away in Southport’s Gold Coast University Hospital last Tuesday following a stroke, on top of complications associated with treatment for another illness. A private funeral involving immediate family members was today held at Nerang’s Allambe Memorial Park Crematorium, not far from Carrara. On the eve of his former team’s contest with the Suns on Sunday it is indeed ironic that Galt died where he had lived on the Gold Coast, as he previously patronised Metricon Stadium in matches involving the Blues with his now 14 year-old daughter Isabella and 12 year-old son Alex. Only last July, Galt frequented Metricon in the lead-up to the Blues’ Round 19 match, as Greg explained. “I know last year he was at the ground and recognised one of the Carlton managers, Shane O’Sullivan I think it was, whom he called over. “The manager said ‘Who am I talking to?’ to which he replied ‘It’s Galty’,” Greg said. The ‘Spook’ nickname Galt inherited stemmed from his slim build, pallid complexion and shock of long blond hair. Originally recruited to St Kilda from Beaumaris in 1971, the year the Allan Jeans-coached Saints challenged Hawthorn for the Premiership, Galt was considered “the new Carl Ditterich”, though he would never quite meet that lofty expectation. Galt got a late run off the bench in the ’71 Grand Final – one of 77 senior appearances with St Kilda through to 1974 before gaining a clearance to Carlton season’s end. Completing his senior debut in Dark Navy in Round 17, 1975 (versus Hawthorn at Princes Park), he would turn out in 46 senior matches in total, wearing the No.17 guernsey vacated by the equally enigmatic Brent Crosswell, before his League career ended in the Carlton Premiership year of ’79. Galt, it’s fair to say, was a football journeyman, as Carlton’s historic website The Blueseum attests. Incredibly, he was loaned to Bendigo League club Kennington for one match in June 1977, before he crossed state lines to Western Suburbs in Sydney where his presence was more telling. Settling into life in the Harbour City, Galt rediscovered his best form, and topped off a memorable few months by starring in the Sydney Football League Grand Final. For the record, Wests accumulated 14.15 to North Shore’s 5.2 in the second half of that Premiership decider, with Galt clearly best on ground in the former’s comprehensive triumph. Perhaps it was that performance that ensured Galt’s VFL career would endure for a little longer, and on the end of his return to Princes Park in ’78, he savoured his most successful season. In a run of games between Rounds 9 and 12, he booted three bags of six goals each, as Carlton rebounded from a poor ’77 season to once again qualify for the finals in fourth place. Experiencing his first VFL final since vacating Moorabbin, Galt contributed three goals to Carlton’s scoreline in its victory over Geelong in the 1978 Elimination Final, and notched another three the following week when the Blues’ season ended with a loss to Collingwood in the first semi. In the process, he finished the year with club goalkicking honours (49), and paved the way for a shift to full-forward in ’79. Galt opened his fifth season at Carlton in rare form, putting 16 over the goal umpire’s hat in his first five games as the spearhead - only to taper off again mid-season amid rumours of clashes with his captain-coach Alex Jesaulenko. While the Blues carried all before them en route to the minor Premiership and ultimately, Carlton’s 12th flag, Galt again found himself in the curtain raisers. 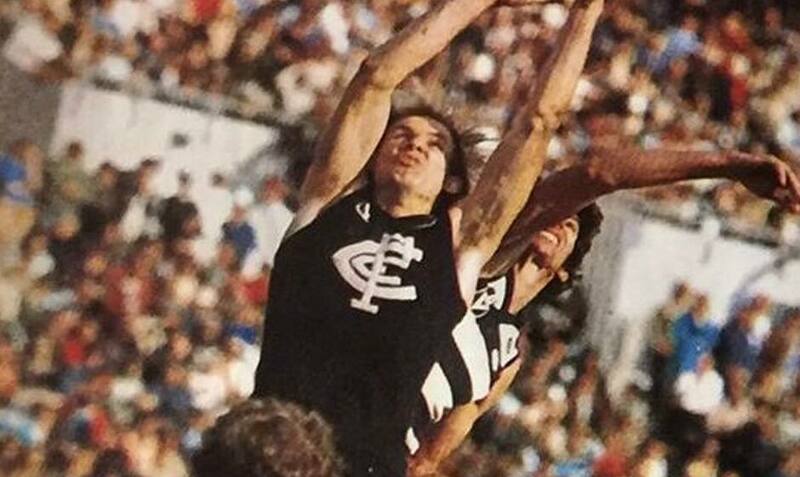 He was recalled for another handful of senior games late in the year, but couldn’t recapture the spark of ’78 and his career came to an end after Collingwood inflicted a 19-point defeat on ‘Jezza’s’ Blues at Victoria Park in Round 21. The three-time Carlton Premiership player Ken Sheldon, who joined the club from Mitiamo in 1977, remembered Galt’s stabilizing on-field presence at Princes Park, as him and the likes of Jim Buckley and Wayne Harmes were finding their feet. “He (Galt) was there when I walked in the door, and he was in and out of the senior team. His application mightn’t have been that great, but he had a capacity to really lift in big games and he was a terrific influence because he knew how to play,” Sheldon said. On his release from Carlton at the end of the ’79 season, Galt was lured to SANFL outfit West Torrens by the legendary South Australian football identity Neil Kerley. He spent five more seasons with the Eagles, before returning to Victoria to go around for just one more season, specifically for Prahran in the VFA. In the years after his football exploits were consigned to history, Rodney Maxwell Galt embarked on what was at the outset a hugely-successful business career on the Gold Coast. As the Managing Director of surfwear manufacturer and retailer Byrning Spears, he helped grow the company into one of the nation’s largest brands and made headlines in 2008 when he and his former wife Elizabeth purchased the most expensive beachfront mansion – the ‘elephant’ house on Hedges Avenue, Mermaid Beach - for a record $17million. In those heady days, you could often find them frequenting the Gold Coast Turf Club, cheering on their thoroughbred racehorse,Carlton Forward. Greg described his older brother as “pretty passionate about everything he did”.